You can feel the anticipation for Star Trek Into Darkness out there, can't you? Sure, the movie doesn't open until next May, and in the meantime we've got movies like The Hobbit and Django Unchained to look forward to, but in the last few days J.J. Abrams has chosen to lift back the veil on his super-secret sequel-- just a tiny bit, and enough to get us good and excited. Yesterday Eric got an early look at the nine-minute scene that will play in front of The Hobbit this weekend, and today he's at the offices of Bad Robot themselves to talk to the people behind it. For the rest of us plebeians, though, Paramount has given us another look at the film-- and possibly a revelation of the character Benedict Cumberbatch is playing. Take a look at the image and we'll discuss further below. 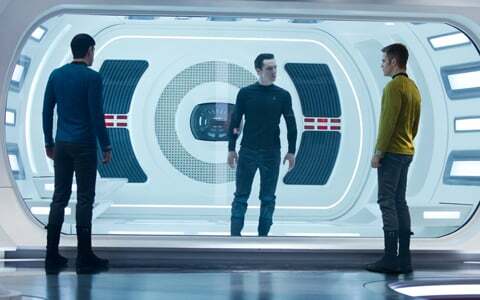 No, there are no hints in the image itself-- in fact, in that Starfleet universe, Cumberbatch looks like he could be just another crew member of the Enterprise. But the caption identifies him as "John Harrison," which seems like a pretty clear indication that it's the name of his character. That might be a disappointingly dull name for fans who were hoping for a return of the iconic Khan, or even for the name that Karl Urban seemed to leak over the summer, when he claimed Cumberbatch was playing Gary Mitchell. Was Urban misleading us all along? Does it really matter? The answer to that last one is "no," because come on-- you don't really want to know the name of the villain before you see the movie. We like Abrams's films because they're original, and even though Star Trek Into Darkness will bring back all the familiar characters, it's the new elements we can look forward to most. Hopefully we'll learn a little bit about that-- but not too much-- after Eric's visit to Bad Robot today. In the meantime we can keep poring over the teaser trailer and keep May 17, 2013 marked on our calendars.